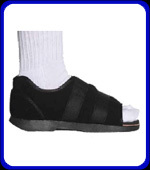 Post-op Shoe Semi-Rigid – Pacific Medical, Inc.
Semi rigid flex sole design. Ideal for the sensitive foot. A soft breathable nylon upper will keep patient cool and comfortable. Outsole notch provides a shoe - like profile.